CANTON, Mass. – While the majority of Hockomock League teams have hit the field, court, or links over the past two weeks to get their seasons underway, the Canton field hockey team has been left watching. Between hot weather and thunderstorms, the Bulldogs have had their first game pushed back on a couple of occasions. Canton finally began its 2018 season on Friday afternoon and used a late surge in the second half to pick up a 2-1 win over visiting Franklin. “It was our first game, had a very long preseason I think it took them a little while to get out of drill mode and get into game mode,” said Canton head coach Chrissy O’Connor. “We made some changes on the field and once it kind of clicked, then they started to get more comfortable. Trailing 1-0 in the second half, the Bulldogs came to life at the midway point. After fending off pressure from Franklin over the first 15 minutes of the second half, Canton turned on the pressure. After earning a penalty corner, Canton’s Meg Aldrich served a pass in. Maria Femia was able to put it back in, Molly Cummings deflected it along, and senior Maggie Malloy cleaned up the loose ball to make it 1-1 with 12:50 to play. Canton kept its pressure up and found the back of the net again just over a minute later. Malloy had her first shot denied by Franklin goalie Christina Luccini but the Panthers defense was unable to get a clearance. The ball popped back onto the stick of Malloy, who pushed it forward some and then unleashed a hard shot at the near post that put the Bulldogs up 2-1. Franklin’s best chance at an equalizer came with just over six minutes to go. Senior Cassi Ronan split a pair of defenders and sent a pass into the area to Ashley Reutlinger but Canton defender Allie Gefteas made the clear. “We let down a little bit,” said Franklin head coach Michelle Hess. “That’s something we’ve been working on because we get a little too comfortable. We let down and [Canton] completely capitalized. We’re still learning to bounce back, we let down once and then again right away. Hopefully, we can work on some transition stuff and have them get right back in the game. We have two starters out so we had a little bit of a different look today and for it being the first time, they did pretty well. But once we get healthy I think we’ll be more solid in the middle and in transition. It was a back-and-forth contest early on but little chances for either side. The Bulldogs had the best two chances early but couldn’t get a chance on net. A shot from Maggie Malloy was deflected in the 9th minute but freshman Erin Lane couldn’t get to the loose ball before it skipped over the end line. Ten minutes later, Kaitlyn Goyetch found Femia in front but Franklin freshman Kate O’Rourke did well to break the play up before a shot. The first shot on goal came from Reutlinger in the 22nd minute, forcing a save from Canton sophomore goalie Riley O’Connor. On the ensuing corner, Reutlinger linked up with Ronan and the senior lofted a shot perfectly over the goalie and just under the bar for a 1-0 lead. 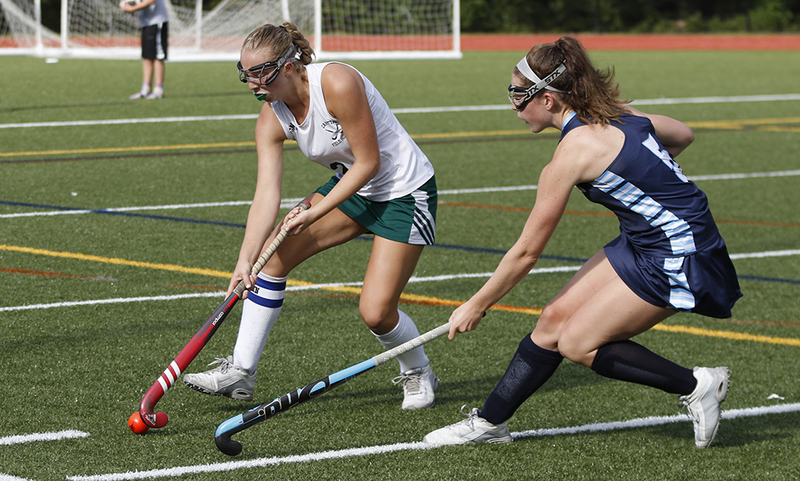 Canton nearly tied it just three minutes later when Goyetch found Malloy in the middle but Franklin goalie Anna Jardine closed the pads at the perfect time to deny the chance. Malloy had another chance two minutes later but Franklin’s Elizabeth Clark thwarted the bid. Before Canton took momentum in the second half, Franklin was just inches away from doubling its lead. Ronan’s shot was deflected by Olivia Rondeau and found the stick of Stephanie Bell. But Canton’s Rose Malloy was positioned perfectly on the goal line to knock the shot away. Canton field hockey (1-0 Hockomock, 1-0 overall) is back in action on Monday when it hosts Stoughton at 7:00. Franklin (1-2, 1-2) hits the road to visit Mansfield on Monday afternoon.